Port of New Orleans (Port NOLA) held its annual Truck Driver Appreciation Week Oct. 30 – Nov. 2, 2018, to celebrate those who transport containers and breakbulk cargo on our nation’s roads and highways. 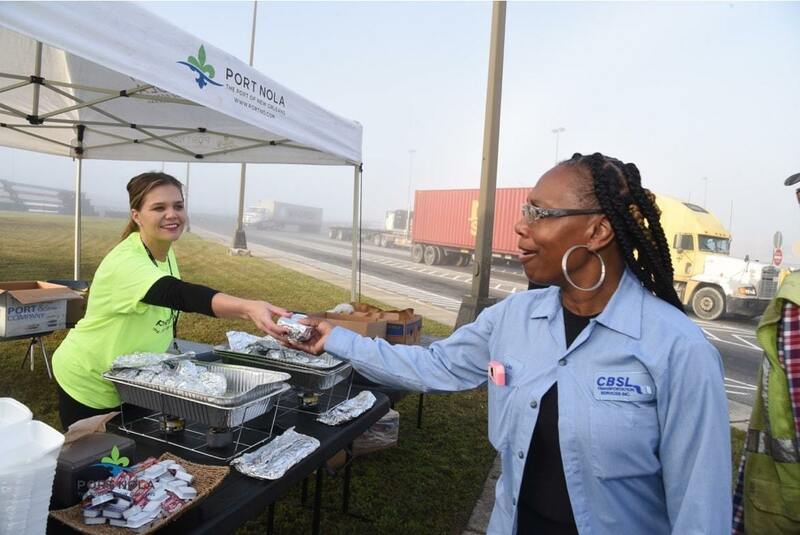 “Truck drivers play a vital role in the international supply chain and we’re grateful for the dedication and hard work of the Port’s trucking community,” said Brandy D. Christian, President, and CEO of the Port of New Orleans. Appreciation breakfasts were served twice during the week, and a jambalaya and hamburger lunch was held on Halloween and served by costumed volunteers. Port NOLA partnered with tenant, business and community sponsors including BIS Construction and Ship Services, Crescent Transport, Folgers, Gulf Intermodal Services, New Orleans Terminal, Penske, Ports America and TCI Transportation Consultants. Truck drivers tackle one of our economy’s most demanding and vital jobs and play a key role in first and last mile delivery of cargo. Safety is of the utmost importance and Port NOLA included roadway safety promotions as part of the week’s celebrations. Remember, large vehicles do not drive like automobiles. Trucks tend to have special hazards. They have large blind spots, also known as “No Zones,” and need additional room when making turns. A trustworthy rule to follow at all times is if you cannot see the operator of the truck in their outside mirrors, then he/she probably cannot see your vehicle. At night, use low beam headlights when following large vehicles. It is recommended that you maintain at least a minimum of a four-second following distance. When passing a large vehicle, remember they are much longer than an automobile and will take longer to pass. Maintain a constant speed when passing and be sure you can see the front of the cab of the truck in your rear-view mirror before pulling back into the lane of travel in front of the truck. Keep in mind that it is a violation to exceed the posted speed limit to pass any vehicle. When being passed by a large vehicle slow down slightly, as water spray or dirt from the vehicle’s tires can reduce your visibility. Be especially careful when passing a large vehicle that is also pulling a trailer. There are times when the trailer may swing into your lane. Since large vehicles need additional turning space, never try to squeeze into the space next to a large truck when it is making a turn. As the truck continues its turn, there is a risk of your vehicle being trapped or driven over. National Truck Driver Appreciation Week was celebrated Sept. 9 – 15, however, Port NOLA moved its schedule events into the fall due to the hot weather conditions. National Truck Driver Appreciation Week is an opportunity for the trucking industry and the business community to make special efforts to recognize professional truck drivers, according to American Trucking Associations, the largest national trade association for the trucking industry. For more information about trucking safety, please visit the National Traffic Safety Institute.